Cut out words from newspapers and make captions, headlines, short sentences and even some silly sentences! How many nouns can you spot while you are out? Word association game – say a word and come up with as many words as you can that are associated with this word. Word disassociation – the opposite. 3DL - Citizens of the United Kingdom and the World! Last week in English, we wrote a set of instructions on how to wash a mythical creature. We needed to think carefully about how to stay safe from the dangerous body parts but also make sure the reader was told exactly what to do. After we had planned our instructions using a storyboard, we drafted them before editing and improving them with our partner. Once we had a perfect version of our instructions we best copied them in our neatest handwriting to go on the Wow! working wall. At the end of last week, Hindus around the world celebrated Holi so we have been finding out why. We learnt that it is the festival of colour and is to remember good overcoming evil. During this festival Hindus throw coloured powder at each other so we used Andy Warhol’s Pop Art style to create our own images. 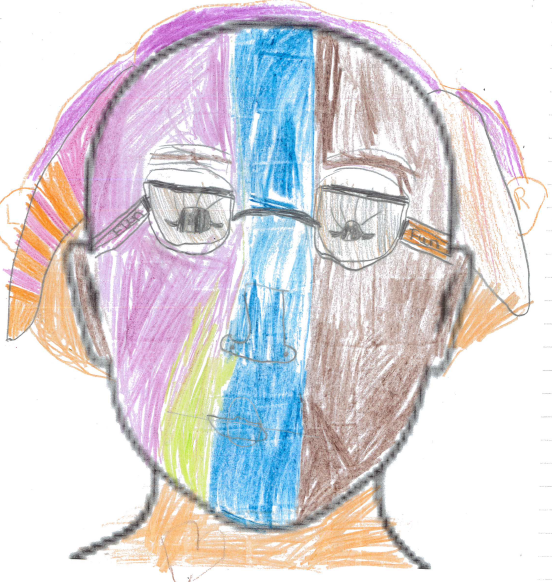 We drew a self-portrait and then coloured it in very bright colours. In History we listened to a piece of music related to the Romans. We thought about what it reminded us of and how it made us feel. 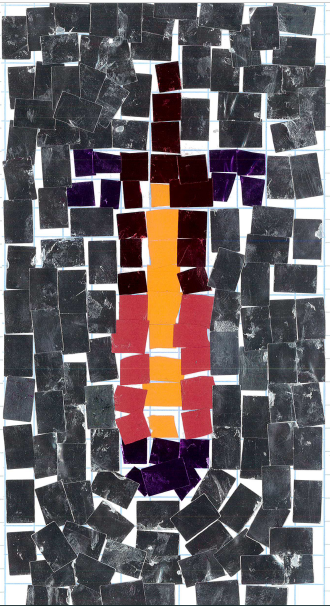 We then used our pictures and symbols to create a mosaic using tiny squares of coloured paper. In computing, we have been researching the Commonwealth as it was recently was Commonwealth Day. We made a Word document of the interesting facts we had found out and inserted an image from a website by using the copy and paste tools. A big thank you to all classes still participating in the Daily Mile even though there have been some limitations with the ongoing building works. The route may have changed slightly but the children are still smiling. Well Done. A range of clubs have been available for the children to participate in. Many children are attending at least one club with a large group attending more than one club. Various children across the whole school have been working with Mrs Smith in the outdoor garden zone to plant vegetables and discuss their importance. As part of being a Healthy School, we encourage children to eat healthily at both break time and lunch time. We have been monitoring what the children are bringing to eat at snack time and have noticed some children are bringing crisps, chocolate and sweets. These are not healthy snacks. Lots of children already cycle or ride scooters to school but as ‘The Big Pedal’ is back - beginning Monday 25th March - for two weeks, we will be encouraging children even more to cycle, scoot or roller skate all or part of the way to school. Class teachers will monitor and record the results. These are then gathered into a database where the school has a chance of winning prizes. Help us sustain our push for healthier lifestyles and win some prizes! East Tilbury have been very busy with their writing over the past couple of weeks. We have been exploring various things across the year groups and everybody has been working exceptionally hard. Year One have been exploring instructional texts for their non-fiction text-type this week. Amazingly, they have been exploring the steps to creating ice cream! They have been looking at the importance of chronology within their work and have been varying their sentences with different openers. Sounds like an amazing week for them... who doesn’t like ice cream? Year Two have been working on newspaper reports. They have been exploring the features of newspapers and using what they have discovered to create their own article. The pupils have managed to create a newspaper report based on the incident involving Goldilocks and the Three Bears... I wonder who is blaming who for that incident? Year Three have also been working on instructional writing. By using a Pie Corbett-style model they have managed to successfully work through different in-class stations in order to retell a set of instructions; these workstations incorporated all the learning-styles which learners could use throughout a lesson. They have been using these skills this week to prepare for their latest instructional text: How to wash a mythical creature – I wonder how we could wash a dragon without sustaining an injury? Year Four have been looking at what makes an effective film review. By balancing arguments between positives and negatives about a film, the year group have managed to effectively argue about both points. The review was based on the short Pixar movie ‘Bao’ and the features were used effectively to create a personal review based on their own opinion. I wonder what the film was like... we will have to read some reviews. Year Five have been working hard to explore instructional writing for their non-fiction genre. They had linked their learning into science week: they were writing a set of instructions based on how to make a paper plane. By exploring the features of instructional writing, linked in with their science learning, they were able to create a successful set of instructions. In Year Six, they have been exploring instructional writing. The topic of this writing is: How to Annoy your Teacher. This topic has really engaged them in their own learning and understanding of the genre. Pupils have responded brilliantly to this topic; I think that they could be professionals at this. Some of their ideas have been brilliant for a degree in teacher annoyance; some have not (well, for the teachers anyway). To the Moon and Back in Year 2! Year 2 have been continuing their work on fractions this week. We have been busy solving word problems and looking at reasoning tasks. We are all now confident in finding ½ ¼ ¾ 1/3 2/3 of shapes, numbers and quantities. To find these, we have been looking at dividing by the denominator and counting the parts stated by the numerator. We have also started learning our 4 times table in class and have used the Bee Knees Dance Party track on youtube (link below). In our foundation lessons we have continued to learn about space. The missions we have received allow us to research and train to be mini astronauts following a similar programme run by NASA. We have also developed our historical skills and learnt about significant events and people in history. 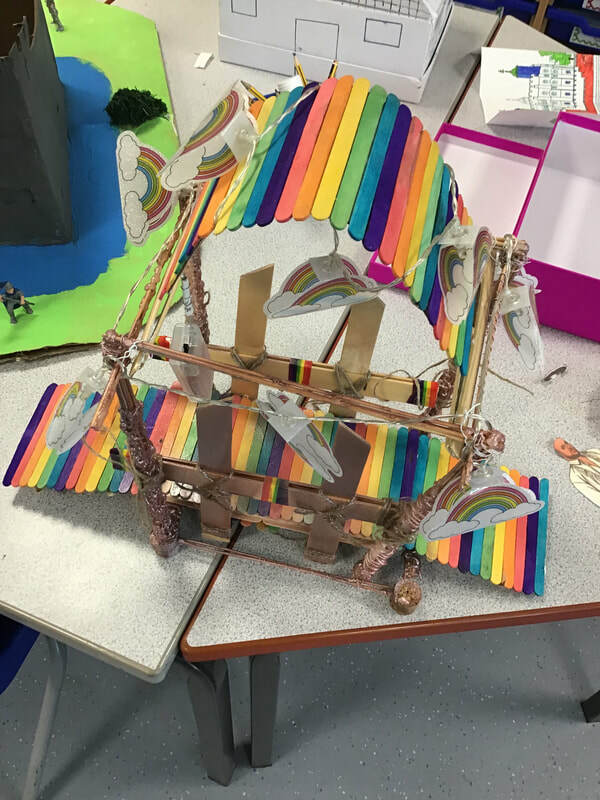 We will continue with this unit until the end of the spring term, and look forward to sharing our learning at the next project evening. This week in maths we have been measuring in metres and centimetres. 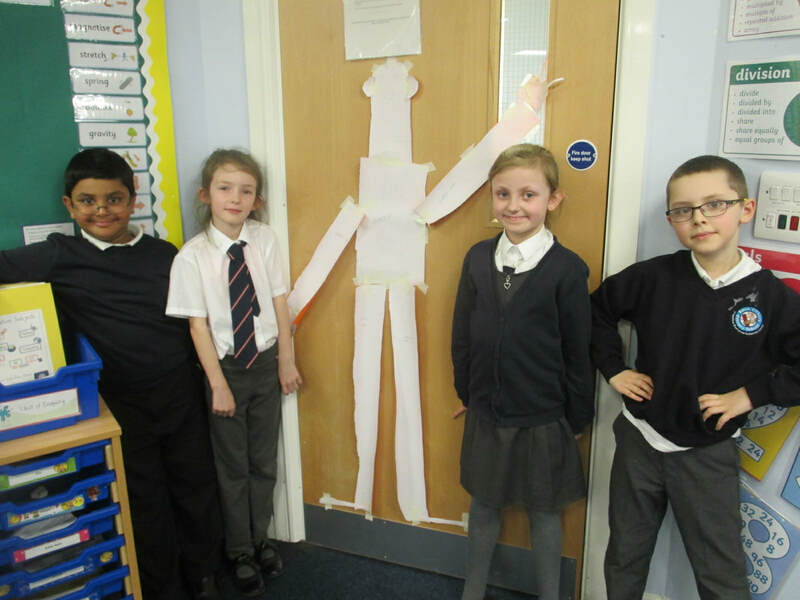 On Tuesday we measured a class friend. First we started measuring them from head to toe to put on the paper. We used measuring tapes which had numbers. We measured their arms and legs first then we cut out the body, arms, head, legs and feet. After we finished that, we stuck them to the table in the right positions and wrote the child’s name. We went swimming this week to improve our swimming skills. For seven weeks, we have been learning how to swim on our backs, how to be brave and jump in the big pool and how to blow bubbles with our head under water. We have used a noodle or floats to help us swim better, otherwise we might drown. Recently, we dressed up as our favourite character from our favourite book or film. In English we best copied our stories onto star paper and put it on our Wow! Work wall. At the end of the day we relaxed on pillows or bean bags with snacks while we listened to stories. We also had a book sale after school. Year 5 - En Ville! 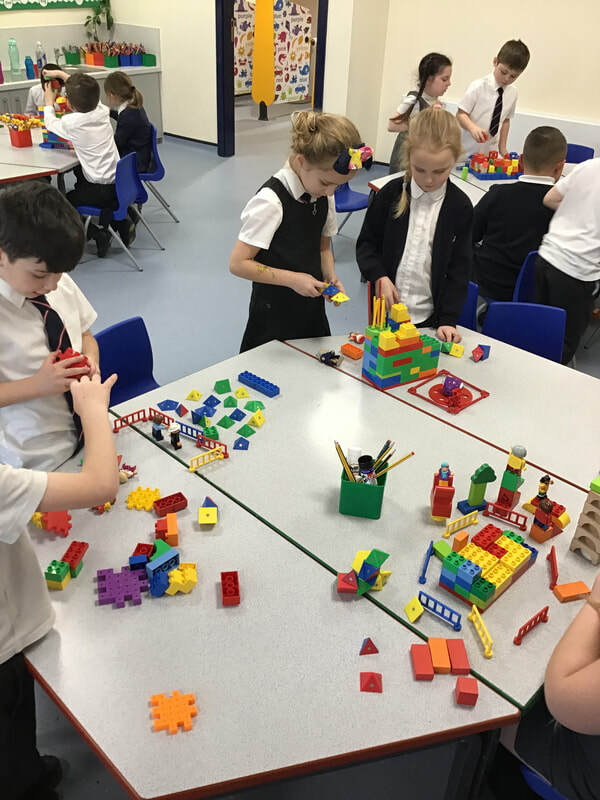 In Year Five this term the children have been learning about ‘En Ville’ which is French for ‘In the City’. The children have been learning language related to towns and cities. 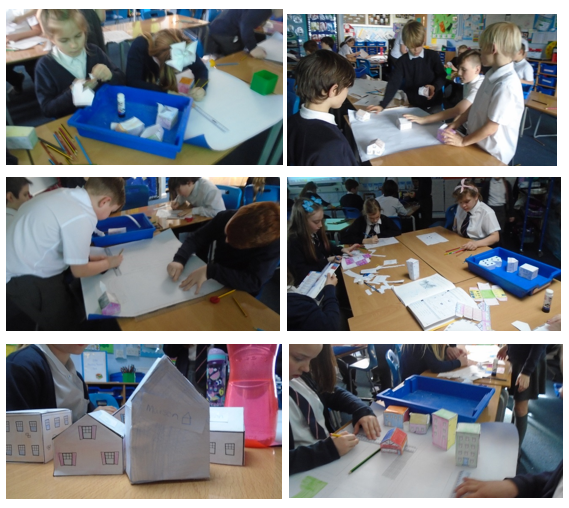 5NM have started to create their own 3D French towns which they are beginning to label with the support of iPads and French dictionaries. Across the school we use the Rigolo scheme of work which builds on French vocabulary across Key Stage Two. If you would like to help your child further develop their French vocabulary please visit the BBC schools language website. 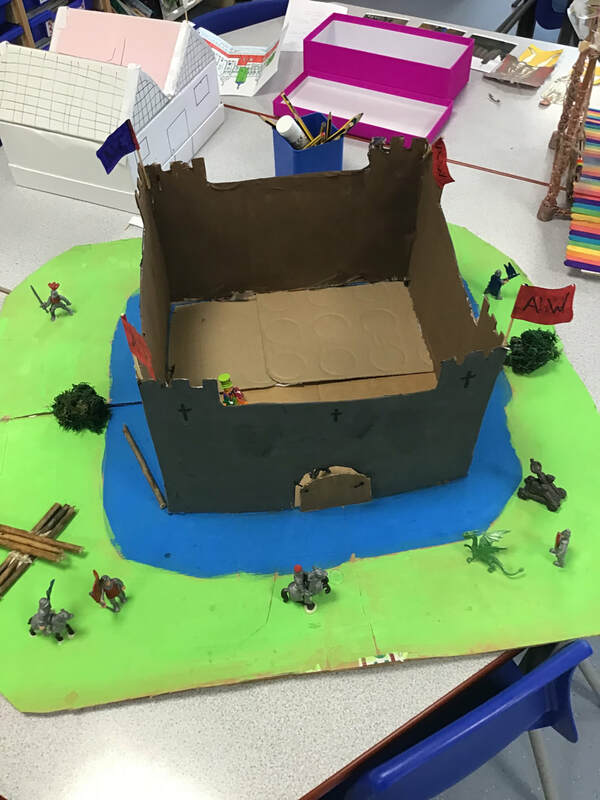 1CS have had a very exciting term learning all about Castles. 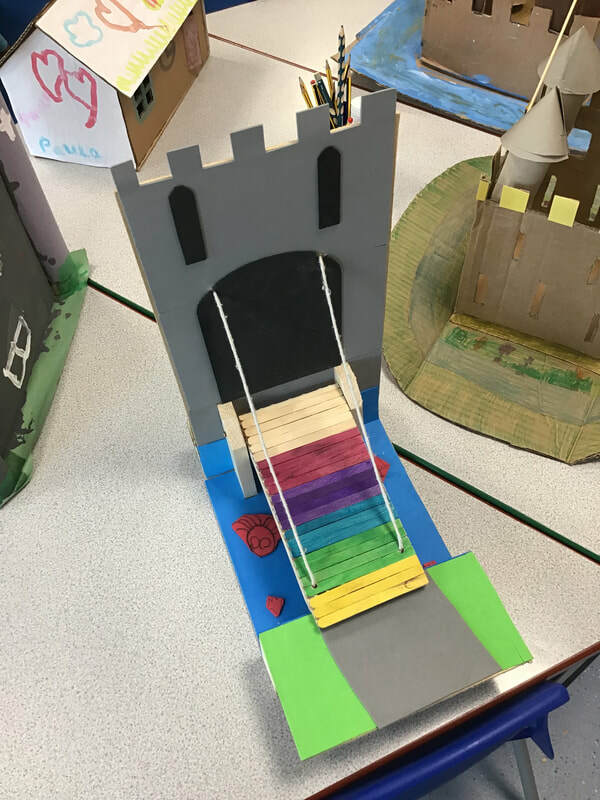 We have explored the different features of a castle and can all name elements such as the bailey, towers and a moat. 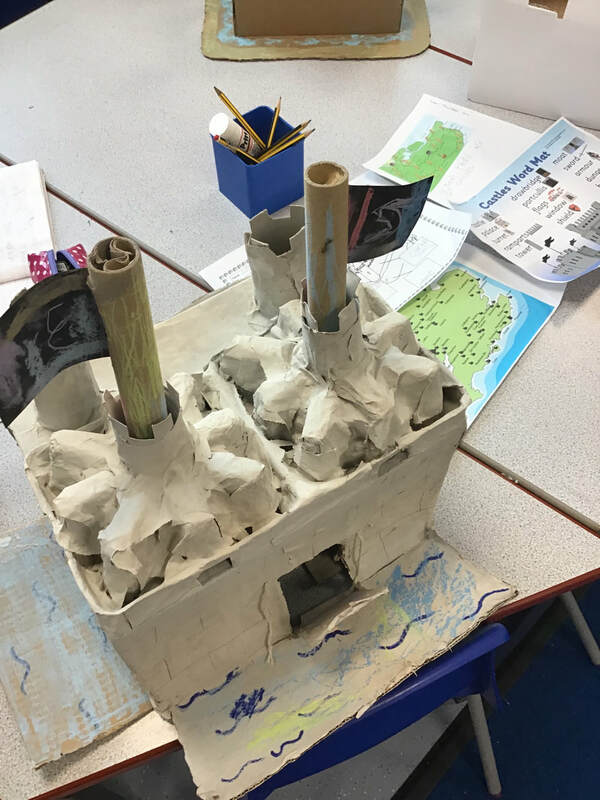 We have used different materials to build castles, such as Lego and cardboard boxes. We have looked at castles from around the United Kingdom and have named the countries of the UK. We’ve looked at the capital cities in each of these countries and located them using a map. This week we looked at aerial view and what this means. We then created our own maps of the classroom and used them to find a hidden object. 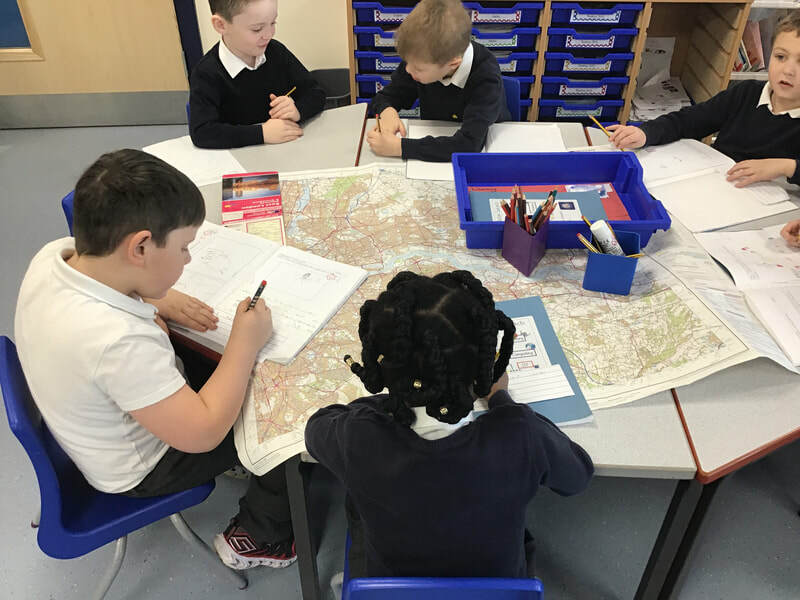 We really enjoyed exploring different maps and were fascinated by the different symbols on the maps. We created keys for our own maps. Recently, we shared our homework projects which we have been working on at home. They were all very impressive and each person that completed one of the tasks had clearly put in a lot of effort in creating these. It was wonderful to have the parents and carers come into our classroom to share our learning with us. For the past two weeks we have been looking at the story Rapunzel in her tower. We worked very hard to retell the story, using different methods such as story maps, role play and puppets to help us. We then looked at the character of Rapunzel and decided to create our own character. Following this, we wrote our own story using the structure of Rapunzel and adding in our own character. What Have Children Been up to in Forest Schools? This term we have been very busy looking and reflecting on the seasonal changes. We took part in the RSPB garden bird watch and made bird feeders to help the birds during the cold weather. Our outdoor classroom has been a great asset to our School. It has been brilliant for bird watching during the cold months. We have been able to remain outside with Shelter. Thank you again to our amazing PFA for making this happen. 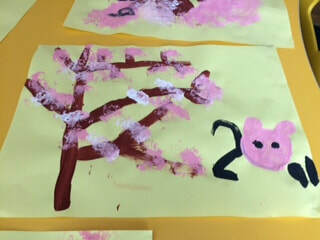 We have been discussing the cherry blossom with the children and how it is important in the Chinese culture around the time of the Chinese New Year. We followed this up by looking for the signs of spring in our school environment and painting cherry blossom pictures. We have been bug hunting and are getting very excited about the insects starting to wake up, we have planted crocus to attract the first bees. The Nurture Group children have been growing a hyacinth bulb in class and in wellies outside. They have been observing the difference and how they have been growing. This has been helping them to name the parts of a plant and to understand what plants need in order to grow. 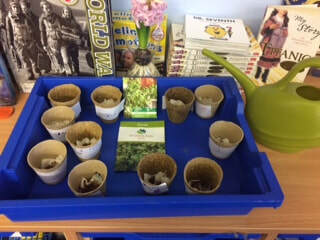 Growing cress has been very popular and the children were keen to taste it.